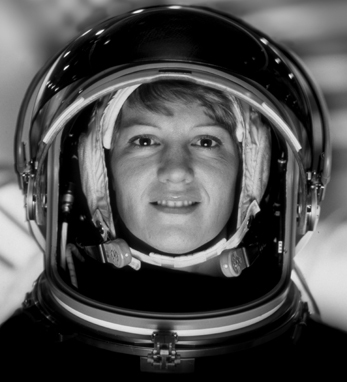 Former NASA astronaut and Air Force colonel Eileen Collins was the first female commander of a space shuttle mission and a career U.S.A.F. officer. In 1999, she commanded the Columbia mission STS-93 to launch the Chandra X-ray Observatory, the most advanced X-ray telescope produced at the time. Collins was born in Elmira, New York, the second of four children of Rose Marie and James Collins, whose ancestors are from County Cork. She had an interest in flying from an early age and received an R.O.T.C. scholarship to study at Syracuse University in 1976, marking her entrance into the Air Force in the first year women pilots were accepted. In 1990, she was selected to the astronauts training program and became an astronaut the following year. In 1995, she made history as the first woman to pilot a space shuttle when NASA chose her to fly the first U.S.-Russia Shuttle/Mir rendezvous. She retired from NASA and the U.S.A.F. in 2006.